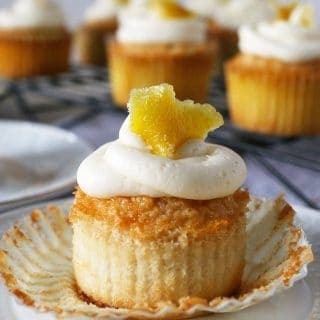 These white cupcakes with lemon frosting are filled with lemon curd and topped with candied lemon peel. They’re the perfect sweet treat! One of my favorite desserts are cupcakes. They’re hand-held little treats and I always want to go back for more. Sometimes I even let myself eat that second cupcake. When I’m making cupcakes, I like to draw inspiration from some of my favorite Chicago cupcakeries (I made that word up – it should go in the OED in 2017.) Their cupcakes are usually full of some kind of frosting or curd and are topped with delicious frosting and a decoration or two. 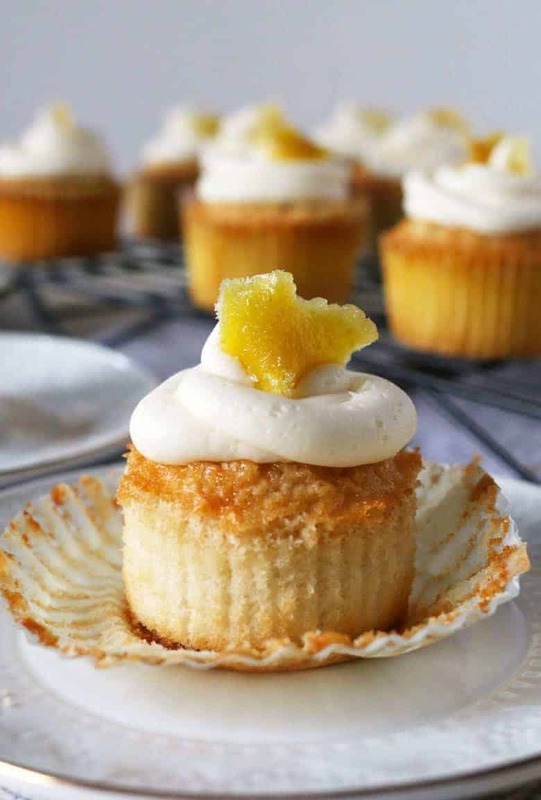 These white cupcakes with lemon frosting are filled with lemon curd and topped with candied lemon peel. How’s that for special?! Before you get all fancy, you need to make your cupcakes. White cake and cupcakes are different because they are made with egg whites instead of entire eggs. This year I have been working with Phil’s Fresh Eggs to create some delicious egg recipes. 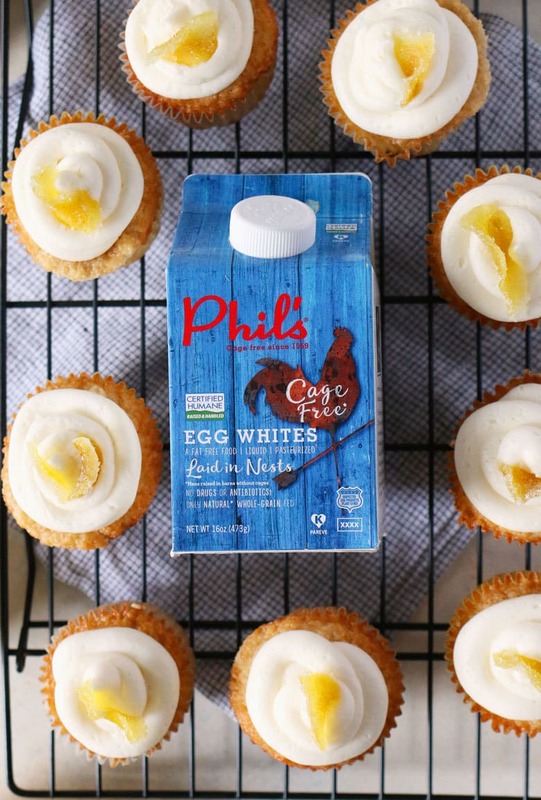 For these white cupcakes, I used the Phil’s Organic Liquid Egg Whites which are Certified Organic by MOSA. I love buying egg whites instead of separating eggs by hand. I always get a little of the yolk when I try to do it and I really wanted to make sure I used only the whites. 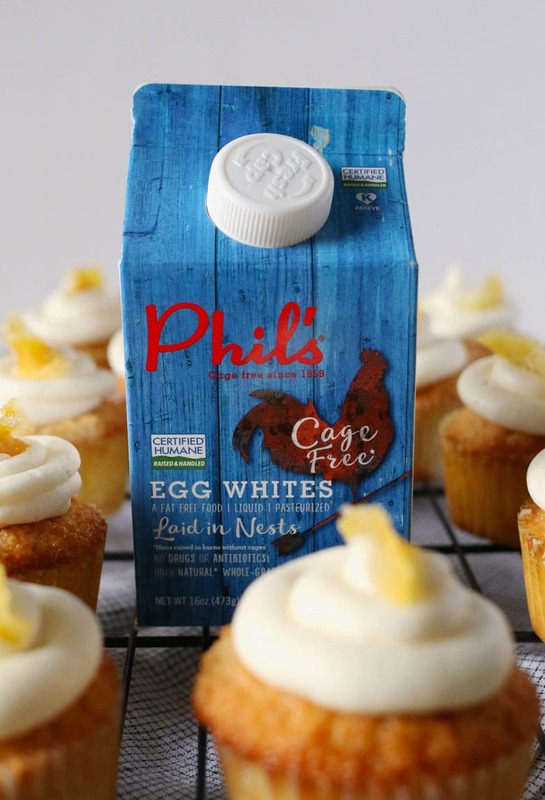 We always have Phil’s Fresh Eggs egg whites in our freezer for baking or cooking. They’re free from cholesterol, fat and trans fat, carbohydrates, artificial colors, preservatives. While my cupcakes are baking, I make the candied lemon peel. To cut the peel off the lemons, I cut off both ends so I can set a lemon upright. Using a sharp knife, I cut the peel off, making sure to leave as much of the white pith as possible on the lemon. Wondering what to do with the peeled lemons? Squeeze the juice and save it for your frosting! Before I frost the cupcakes, I use a knife to cut out the center of each cooled cupcake. Be careful not to cut all of the way to the bottom. Then I fill the holes with lemon curd. 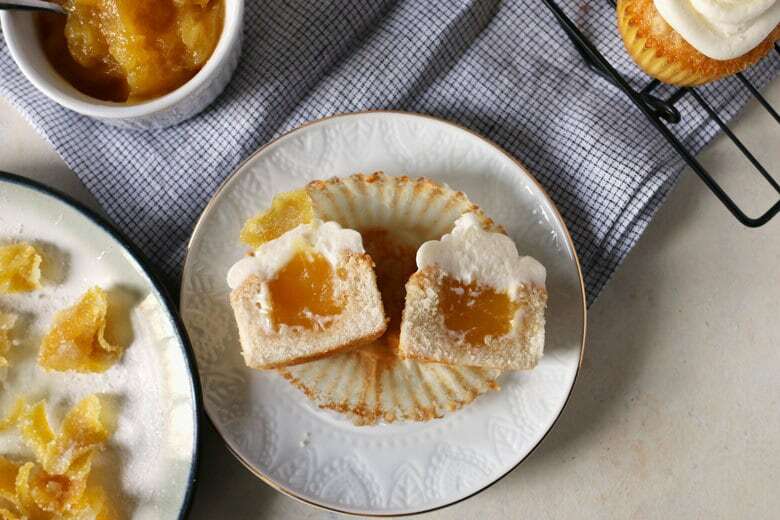 I used store-bought curd for these cupcakes but you could also make it from scratch. My grapefruit curd recipe can be made with lemons instead if you want to go that route. Preheat oven to 350 degrees F. Place cupcake liners in muffin tins - 24-28 liners. In the bowl of stand mixer, cream together the butter, baking powder, sugar, salt and vanilla extract on medium until fluffy, about 5 minutes. Scrape sides as needed. Decrease speed to low and add the egg whites, one at a time, beating well with each addition. Add in 1/3 of the flour, then half the milk, another 1/3 of flour, the remaining milk, and then the remaining flour. Scrape sides as needed. Fill the cupcake liners with 1/4 cup of batter. Bake for 18-22 minutes or until the cupcakes start to brown and a toothpick poked through the center of a cupcake comes out clean. Remove from oven, cool for 5 minutes in the pan. Then remove from the pan and cool on a wire rack. Frost when the cupcakes have completely cooled. Beat the butter at medium speed with an electric mixer until creamy (1-2 minutes.) Gradually add the powdered sugar, alternating with lemon juice, beating at low speed until blended. Cut both ends off of each lemon. Use a sharp knife to remove just the peel, leaving as much of the white pith on the lemon as possible. Bring 2 cups water and the lemon peel to a boil in a small pot. Drain the water and repeat with fresh cold water 2 more times. Drain the water and set the peels aside. Combine the remaining 2 cups of water and the sugar in the pot. Bring to a boil and stir to dissolve the sugar. Reduce heat to low and stir in the lemon peels. Simmer for 5-10 minutes or until the peels are translucent and soft. Remove the peels and allow to completely dry. Toss the dried peels in the extra sugar. To prepare your cupcakes, use a sharp knife to carve out the centers of each cupcake. 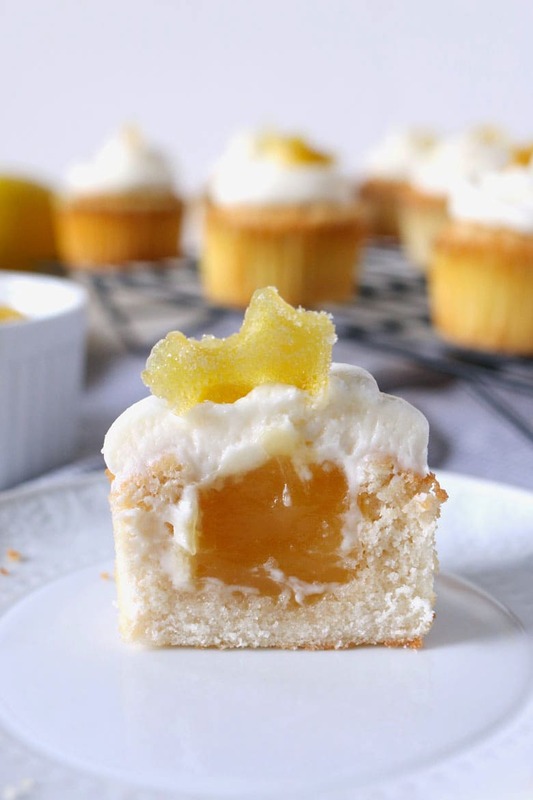 Fill each cavity with lemon curd, then frost the cupcakes. 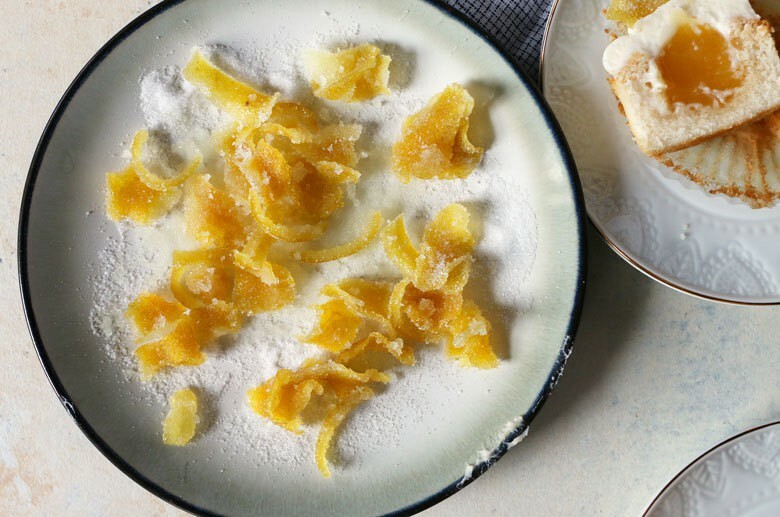 Top the frosting with candied lemon peel. Visit Phil’s Fresh Eggs on Facebook for more great egg recipes and ideas! Check out my other recipes using Phil’s Fresh Eggs! Oh my gosh! That filling and frosting are PERFECT! These cupcakes look so fluffy and delicious! And that frosting – I could eat it with a spoon! I think that’s about to become my new fave product!! AND your cupcakes are BE-YOND! SO gorgeous!! There isn’t one thing about this I don’t love! These are SO gorgeous! And lemon is by far my favorite flavor in dessert!